Another term for green roofs (and green walls) is “living architecture" where roofs and walls are constructed with plants in a special growing medium, drip irrigation, and their respective supporting structures. Living architecture can be built new or retrofitted in place. Growing plants on top of a building is not a new idea. The concept of homes with sod roofs goes back many centuries. Early people understood that sod roofs were "energy smart" as they helped keep indoor temperatures cool in the summer and warm in the winter. As virgin land is replaced by urban sprawl, trees, especially, and green spaces need to be planted to counteract the heat island effect in cities. Without the trees and planted areas, a city’s temperature will increase from the heat radiating from concrete and asphalt. The air will also contain higher concentrations of carbon dioxide and other noxious chemicals. There are other benefits of a green roof. For instance, rainwater can be captured and used to water the roof plants. Rainwater can be retained in the growing medium as opposed to falling down in sheets and eroding soil in plant beds. LEED (Leadership in Energy and Environmental Design) certification is another reason that architects design buildings with a green roof, as they save energy and lower utility bills. Studies show most people would rather see attractive, sustainable living architecture than traditional roofing. So, why are green roofs not everywhere? There are several possible answers. First, the installed cost is more expensive and plant maintenance is necessary, at least in the early years, until the plants become established. However, the initial costs are off-set by savings in utility costs. Second, there is a scarcity of contractors capable of installing a green roof. According to Wikipedia, a green roof can be categorized as intensive, semi-intensive, or extensive, depending on the depth of planting medium and the amount of maintenance they need. An extensive green roof traditionally supports 10-25 pounds of vegetation per square foot while intensive roofs support 80-150 pounds of vegetation per square foot. Traditional roof gardens, which require a reasonable depth of soil to grow large plants or conventional lawns, are considered intensive because they are labour-intensive, requiring irrigation, feeding, and other maintenance. Intensive roofs are more park-like with easy access and may include anything from kitchen herbs to shrubs and small trees. An extensive green roof, by contrast, is designed to be virtually self-sustaining and should require only a minimum of maintenance, perhaps a once-yearly weeding or an application of slow-release fertiliser to boost growth. Extensive roofs are usually only accessed for maintenance. They can be established on a very thin layer of soil (most use specially formulated composts): even a thin layer of rockwool laid directly onto a watertight roof can support a planting of Sedum species and mosses. Some green roof designs incorporate both intensive and extensive elements. To protect the roof, a waterproofing membrane is often used, which is manufactured to remain watertight in extreme conditions including constant dampness, ponding water, high and low alkaline conditions and exposure to plant roots, fungi and bacterial organisms. Another important distinction is between pitched roofs and flat roofs. Pitched sod roofs, a traditional feature of many Scandinavian buildings, tend to be of a simpler design than a flat roof. This is because the pitch of the roof reduces the risk of water penetrating through the roof structure, allowing the use of fewer waterproofing and drainage layers. How is a green roof built? The process involves several steps. First and foremost, it starts with a landscape plan. However, prior to drawing a planting plan, there are a multitude of factors that the designer must consider: sunlight, water source, wind velocity, weight calculation, growing zone, suitable plants, growing medium, drainage, and waterproofing. Waterproofing, above all, is the most important step, especially with a flat roof. Therefore, a thick rubber membrane, no less than 70mm, and that is similar to a pond liner, is glued over the protection board and roof deck. Insulation is put in between the membrane and the drainage/ storage layer. The filter fabric allows water through, but keeps soil from clogging the layer below. The depth of the growing medium is the one element that separates a residential from a commercial job. For a residential application, where small plants would be installed, the standard depth is 4”- 6”. A commercial roof, which can support more plant species and weight, will usually be 6”- 8”. The soil that comprises the growing medium is specially formulated, or engineered. It will be light and porous, yet strong enough to hold plants and trees. If strong wind currents are a factor to contend with, an organic type of fabric made of jute or burlap may have to be placed over the soil to anchor it in place until all the plants grow and fill in. 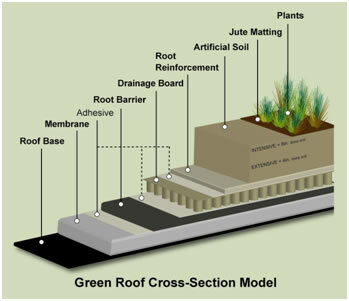 The types of plants that are installed on a roof vary according to growing zones and function of a green roof. For example, if the roof garden is atop a high-rise building, and will accommodate guests and entertaining, then it can contain grass, shrubs, trees, annuals, and perennials. Landscape maintenance and irrigation will have to be done on a frequent basis. On the other hand, if xeric plants like sedum and grasses are being installed on top of a residence, little to no maintenance and irrigation will be necessary. Olivia Munoz Mickalonis is the CEO of an Atlanta-based "think tank" that assists businesses and and non-profits to design and implement sustainability initiatives. If you have questions about living architecture, simply use the ASK THE EXPERT form at the bottom of this page to contact Olivia.